In honor of the 100th year of Veterans Day and the fifth anniversary of the founding of the Center for American War Letters at Chapman University, the play If All the Sky Were Paper is coming home to Chapman’s Musco Center for the Arts stage for a special Veteran’s Day performance on Saturday, Nov. 10 at 7:30 p.m.
Acclaimed academy-nominated and returning actor Annette Bening, popular actor Gary Cole (VEEP), Daytime Emmy Award-winning actress Kate Mansi, and celebrated actor Ed Asner have joined the cast to date. In addition, acclaimed composer Peter Boyer has created an original and compelling score for this production performed with live musicians. If All the Sky Were Paper is a powerful, humorous, and unforgettable play about one man, Andrew Carrol, and his journey around the world for the “most extraordinary war letters ever written.” The play features actual letters written by troops and their loved ones from the American Revolution to the wars in Iraq and Afghanistan. In the play, Andrew Carroll is portrayed by a Narrator, who recounts Carroll’s real-life travels around the world, which are at times heartbreaking and harrowing, and inspiring. Professional and Celebrity Actors portray the military men and women (as well as their loved ones at home) who wrote the letters. Each of these letters chosen for the Play express the full spectrum of emotions and experiences in times of war—from the ferocity of combat to moments of camaraderie and levity. If All The Sky Were Paper is directed by John Benitz, and produced by Victoria Morris of Lexikat Artists in collaboration with Chapman’s Department of Theater and Musco Center. The play is written by historian Andrew Carroll and is based on Carroll’s search across the globe for the most riveting and powerful war letters ever written. 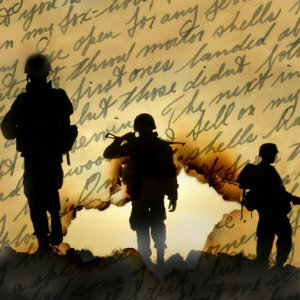 The play features letters from Carroll’s two New York Times bestsellers War Letters and Behind the Lines, all brought to life by an ensemble cast of actors. If All the Sky Were Paper will be performed on Saturday, November 10 at 7:30 p.m. at Chapman University’s Musco Center for the Performing Arts. Tickets are available at muscocenter.org and range in price from $25-$65 with special 50% discounts for veterans and Chapman students. Musco Center for the Arts is at Chapman University at 415 North Glassell in Orange.